The Spiritual Struggle at the Heart of Charlottesville – Rev. Canon Dr. William J. Danaher Jr. I listened closely to President Trump when he called upon us as a nation to “love each other” and come together based upon our common love of God and country. In addition to these words, echoed by clergy and other civic leaders across the nation, the President also vowed to restore “law and order” and to “study” what happened so that the violence and killing would not be repeated. Many have criticised the President for not denouncing racism and white supremacy forcefully. This criticism is valid and true, even as the President has tried to amend these first remarks. However, it’s missing an important part of the story. The President’s response reiterated the way that the leaders of liberal democracies like ours have traditionally dealt with internal threats and conflict. In a nation in which the right to free expression is inalienable, government leaders often deal with troubling people and behavior by trying to achieve a careful balance between repression and reform. When leaders limit free expression, they do so temporarily in order to educate those who hold this right in their proper, civic exercise. Operating behind this strategy is the belief that once people are able to articulate their views peacefully, and tolerate the views of others, other points of view in the marketplace of ideas would moderate their perspectives and positions. Over time, the good would prevail, and the center hold. First, the groups of white supremacists protesting the removal of the statue of Robert E. Lee were using the Nazi salute and chanting the slogan, “Blood and Soil.” “Blood and Soil” ( Blut und Boden ) was a slogan used by the Nazi party in Germany to create a sense of the nation built around a white, Aryan “master race” — blood — and the rural areas in Germany — soil — where this master race thrived. The protesters in Charlottesville, then, do not represent a group that are ignorant and in need of education. Rather, they have weighed liberal democracy and found it wanting. They are promoting an ethno-nationalism fundamentally opposed to the basic tenets of our democracy, just as the Nazi party opposed the Weimar Republic in the 1930’s. Second, the majority of the protesters who gathered in Charlottesville — about 70% according to an eyewitness I trust — were white males in their 20’s and 30’s. This tells us that the protesters are not men who have lost their jobs in a rapidly changing economy, nor are they people who have seen the social safety net under them fray. They have no grudges to hold — other than the perceived loss of the entitlements they feel due to them based upon their racial and ethnic identity. What is more important, far from being ignorant, these young men have likely already received years of anti-racism and multicultural education in their schools. Third, the conflict in Charlottesville is not a “local” problem, but a national bellwether. 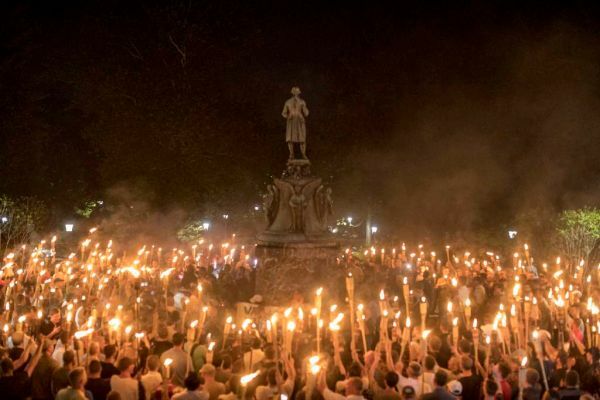 The vast majority of protesters were not local people from Charlottesville trying to protect their traditions and culture, but outsiders who saw an opportunity and tipping point for advancing a national agenda. This national agenda touches us here in Michigan in a real way. Among those present was a group called the “Detroit Right Wings,” who adhere to an anti-immigrant vein of white supremacy and traveled to Charlottesville thanks in part to support from online donors. The protesters, then, were not ignorant. The grounds for their anger was ideological, not historical or existential. Their movement is not local but national. Their politics is based on a rival belief-system that denies the sacred foundation upon which our liberal democracy is built — that each person is created equal and endowed by the Creator with an inalienable right to life, liberty, and the pursuit of happiness. This means that we are not waging a war of ideas, but we are experiencing a spiritual struggle and spiritual warfare — “against principalities, against powers, against the rulers of the darkness of this world” as one traditional translation from the New Testament (Ephesians 6:12) puts it. Because the battle is spiritual, the greatest threat is that we will lose our own souls in the process of trying to prevail. It will be tempting, over the coming days, to respond to the violence in Charlottesville with violence, to disrupt and infiltrate their organizations, to push them back into the shadows of our society, and to treat these protesters as less than human. Some of these tactics may be deemed necessary. Some of them might seem to work in the short term. But none of them will address the core issues behind this ideology — the spiritual sickness which is the soil in which the seed of white supremacy grows. The only way to address that spiritual sickness is to speak the truth with love, because what is needed is not education, but conversion. As an ordained priest and practicing Christian, I am proud of my brothers and sisters who joined other people of faith and goodwill in nonviolently opposing the protesters in Charlottesville. From my perspective, this commitment to nonviolence bears witness to the reconciliation that God has brought to the world through Jesus, to the politics of God that is greater than, and the measure of, all earthy politics. However, we also need to draw as well from the spiritual practices that build the beloved community. We need to examine ourselves prayerfully to explore the ways our own attitudes and actions contribute to this spiritual sickness. We need to stand with those who are the targets of white supremacy as a witness to the human dignity they have as children of God. We need to reach out to other people of faith and goodwill to repair and rebuild the sacred foundations of our country. We need to pray for our enemies, that the love of God would touch and turn their hearts. Most importantly, we need to listen to the promises of God when we read, “Do not fear, for I am with you, do not be afraid, for I am your God; I will strengthen you, I will help you, I will uphold you with my victorious right hand” (Isaiah 41:10).